A moody shot, taken late in 1979 by Bryan Benn on a dull autumn day at Gatwick, while G-AWGS is gaining speed for take off run on runway 26. Probably one of it's last flights for Tradewinds: by early 1980 they were only using B707s. G-AWGS was first registered for Tradewinds on 14Sep1970. 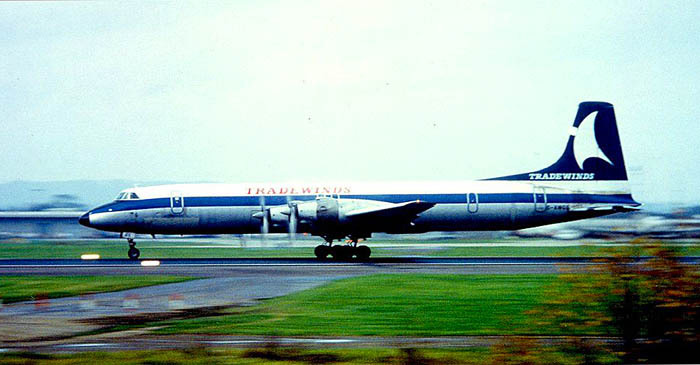 Tradewinds was founded in 1968 (as Transglobe Airways, later changed to Tradewinds) and flew cargo flights from Gatwick in the early 1970s, using Canadair CL44-D4 swingtail aircraft. During 1977 Tradewinds Airways was taken over by the Lonrho Group and in that same year replacement of the CL-44s was started by Boeing 707s (1 in 1977, 2 more in 1979). Tradewinds became Britain's largest pure freight airline. But after the Lonrho group ran into financial difficulties, it had to sell the cargo airline to Homac Aviation. This, however, could not avert fate: Tradewinds ceased to trade on 28Sep90 . Bryan Benn also issued the photos for Remember Invicta International, 3 fine Britannia shots.